Now you can do that with CloneIt5 and CloneIt4. CloneIt5 will send the great trades you perform in your MetaTrader 5 account to your MetaTrader 4 account. CloneIt5 is a simple Expert Advisor (EA) that is attached to one chart in MetaTrader 5. When a trade is opened, modified or closed, CloneIt5 sends the information instantly to CloneIt4 (EA) in your MetaTrader 4 account to replicate the same trade. You must have the current version of CloneIt4 running in MetaTrader 4 on the same computer. It is available here in the Market. Just add CloneIt5 to one chart in MetaTrader 5. CloneIt5 will send any trade information for all of the symbols visible in the Market Window. In your MetaTrader 4 account, attach CloneIt4 to the chart (symbol) that you want to trade. CloneIt5 will take care of all the details and send the lot sizes, take profit levels and stop loss levels to CloneIt4. Whatever trades you perform in MetaTrader 5, they will be reflected in your MetaTrader 4 account. CloneIt5 is not a trading robot. It only sends information about the trades you or another EA has performed in your MetaTrader 5 account. CloneIt5 does not send pending order details, only open, close and modify position information. CloneIt5 and CloneIt4 must be installed on the same computer. 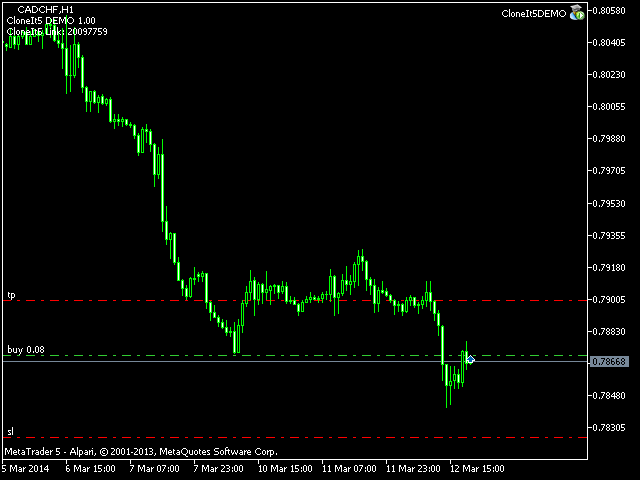 This Demo version only works with CADCHF.